The WHR Heritage Group has won the Welsh Highland Railway Society’s ‘The Francis Blake Award’ which we very much appreciate and thank the Society and its Board for this recognition. 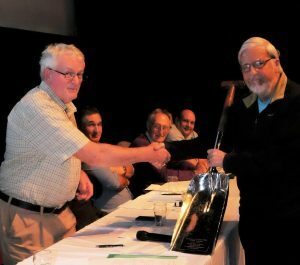 The photograph shows Peter Roughley (our Treasurer) , accepting the award from Society Chairman Dafydd Thomas on behalf of the Group at the Society’s AGM. The Award in memory of the late Francis Blake, is for the group or gang that has done ‘something extra in the last twelve months’ that deserves recognition. Francis was a keen supporter of the WHR as well as a frequent volunteer with the North Wales/Black Hand Gang. The Award, a fireman’s shovel was originally presented to Mr Blake some years ago and it was gifted back to the Society by his widow. Rather than just put it on display in a museum the Society’s Board agreed that it would make an appropriate symbol of work done by a group or gang to enhance and further the restoration, running and interpretation of the heritage of the WHR. Following receipt of the shovel from Mrs Blake, the shovel was cleaned, engraved with a suitable inscription and chrome plated. The award was first made in 2017, the recipients being ‘The Tuesday Gang’, so the Heritage Group follows in some illustrious footsteps!